Pacific Northwest Ballet principal dancer James Moore in Jerome Robbin's "Opus 19/The Dreamer"
The final program in Pacific Northwest Ballet’s 2016-17 artistic season opens with a colorful showcase for retiring principal dancer Carrie Imler (on opening night), George Balanchine’s 1968 work, “La Source.” Alexei Ratmansky’s equally energetic “Pictures at an Exhibition,” for 10 dancers, closes the evening. PNB principal dancers Jerome Tisserand and Carrie Imler in Balanchine's "La Source"
Sandwiched in between these technicolor ballets is a much quieter jewel of a dance, Jerome Robbins’ 1979 “Opus 19/The Dreamer.” It is a stunner, and while I enjoyed the other two local premiers, "Opus" was the highlight of the evening for me. Robbins’ originally created “Opus 19/The Dreamer” for Mikhail Baryshnikov, during the dancer’s only year with New York City Ballet. PNB Artistic Director Peter Boal later performed it, working directly with Robbins, and Boal has staged the ballet wonderfully for PNB. 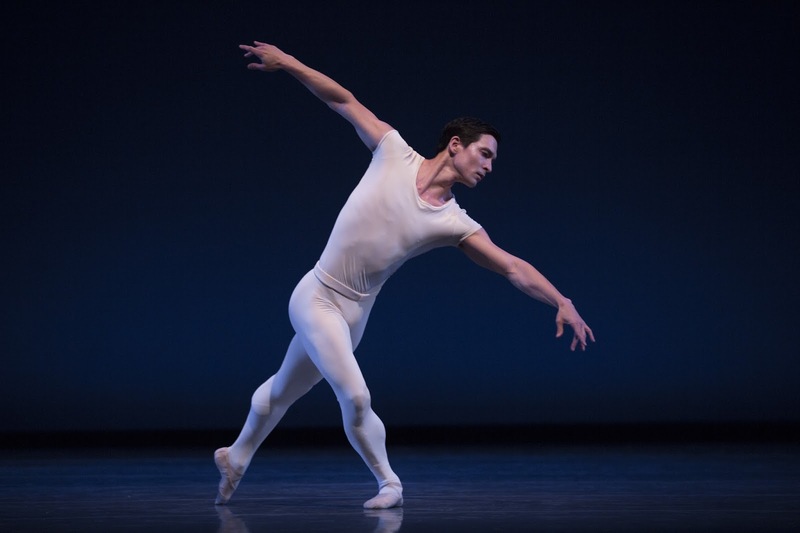 In its Seattle debut, principal dancer James Moore filled his predecessor's shoes, and admirably so. Moore’s Dreamer is just what the name implies: dreamy. Dressed in white, he moves, sometimes lurches, through a delicate chorus of blue-clad dancers who seem to be wafted across the stage by Prokofiev’s strong score (performed by the wonderful PNB orchestra, featuring violinist Michael Jinsoo Lim). The dancers sway, the way plants on the ocean floor pulse with the rolling tide. Principal dancer Noelani Pantastico, in deep purple, emerges from their blue midst, approaching Moore with alternating gently graceful and spiky, angry movements. PNB principal dancers Noelani Pantastico and James Moore in Robbins' "Opus 19/The Dreamer"
While Moore and Pantastico share an onstage chemistry, “Opus 19/The Dreamer” is no “Romeo et Juliette.” This ballet is all about The Dreamer, an inner journey that he dances out seemingly for himself. We in the audience get to peep into his mind but the Dreamer is not there to entertain us; he is searching for something intangible. Midway through the ballet, Moore moves upstage, his back to the audience. He extends his right hand toward the rich blue backdrop, reaching for something only he can see. On opening night, the audience erupted in applause, sensing that Moore’s journey had come to an end. Instead, Pantastico floated in from the wings to stand beside this dreamer, to guide him along another leg of his trip. Noelani Pantastico, James Moore and company dancers' arms in "Opus 19/The Dreamer"
Moore, Pantastico and the 12 corps de ballet members all shone in the opening night performance. As I sat rapt, I couldn’t help but think of George Balanchine’s 1934 ballet, “Serenade,” one of my favorite of his works. 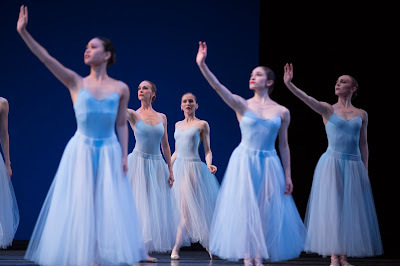 The dancers in both ballets are dressed in blue, but that's merely a superficial similarity. What they share is the quiet power that the best artworks bring. Both dances are serene and contemplative, packing emotional wallops that sneak up on you. PNB dancers, Carla Korbes rear center, in George Balanchine's "Serenade"
“Opus 19/The Dreamer” delivers a tapestry of beautiful images that wash over the audience like the lacy froth of ocean waves lapping on a sandy beach. From the sustained unison pointe work, to a tender moment when Moore and Pantastico gently cup one another’s faces in their single, extended palms, these images are indelibly etched in my memory. As soon as this ballet ended, I wanted to watch it again. You will, too. These are the best to do things when you think that your life is getting no more in use, that’s exactly what old people think but they stop that and read this post rather.